These sesame coated almonds are such an addictive snack. I suggest you make double if you plan on sharing! As I have to be on chronic medication for the rest of my life, I am reluctant to take anything else. I will battle through aches and pains, sometimes to the detriment of my mental well-being. Last month Dave and I went to a function. It was all about hurry up and wait. We got there 15 minutes early as I do not like being late. The day was meant to start at 10am and an hour later we were still waiting. Once we got started we did a short walk, and then planted a seedling. We then walked back to the ‘rest area’ where we did a lot more waiting. And I stood so I could chat to the marketing manager. This was followed by a tractor ride and then more waiting. We then went on to do a wine tasting which took ages due to technical issues. The wine tasting was done in the cellar while we all stood around. Finally we were sent to the chill area to complete a questionnaire. More standing around and by this stage my back was in agony. Finally we sat down for lunch and I felt some relief. But not enough. By Wednesday morning I was an unhappy person. I put a heat patch on my lower back, took an anti-inflammatory and went to the chiropractor. This was followed up by a massage. Nadia commented on the fact that it was the worst she had ever felt my muscles. As I have been seeing her for over 17 years this is a statement I could trust. On the Thursday morning I bit the bullet and went to the Doctor. He gave me an injection and told me to increase my medication. Something I knew I needed to do. These are the perfect snack for anytime! Oh my goodness. Pain is terrible. And that sounds like the worst organized wine tasting ever! These almonds are fabulous. I would have to freeze these!!! Ouch! That sounds painful Tandy. I didn’t realise that you had to take medication for life. I hope you’re ok now? Thanks, I’m much better after a lot of medication. Nuts are addicting alone, I can ONLY imagine how addicting THESE would be!! Well this is a turn of luck as I bought a huge bag of natural almonds the other day only to come home and find another bag. I was going to make up a batch of something or other so these are just the ticket. I assume these turn out crunchy with a slightly sticky coating? I am sorry to read about your back, Tandy. I have to go to physio for by upper back and neck every week and also take daily medication. I hope the injection helped at least. The injection helped a lot, thank you. Sorry to hear you are on daily medication. That is never a nice thing. I hope you are feeling better Tandy, having chronic pain is no fun. 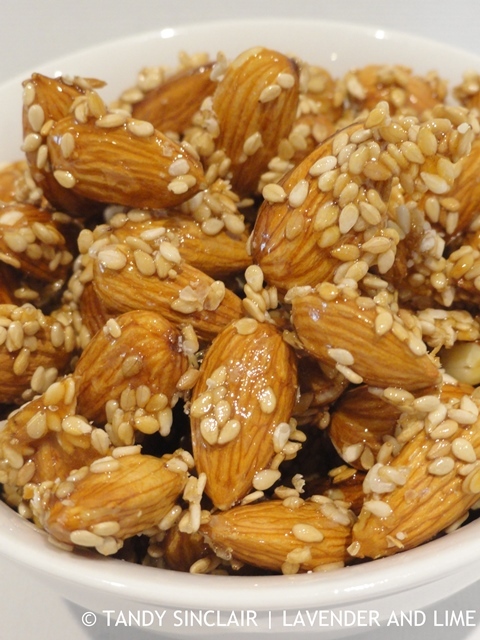 Your almonds look like the perfect party snack. 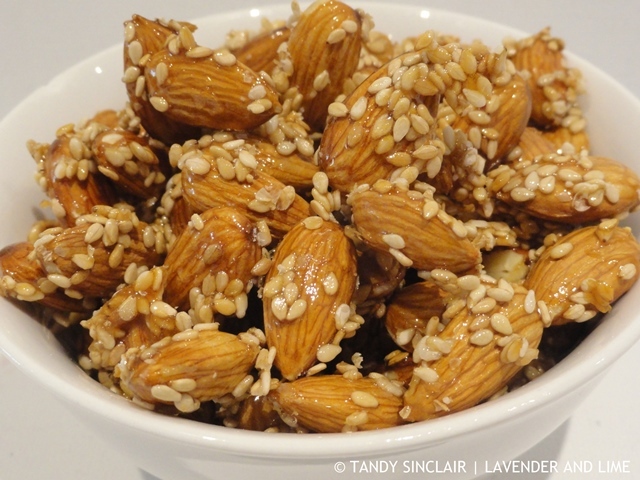 Tandy, I am absolutely addicted to both sesame and almonds so I love this healthy snack! What a great snack for the girls’ lunches!